Imagine looking out at something so immense and featureless that your brain literally just stops comprehending the visual clues being sent to it. That is what it is like to stand on the edge of Etosha Pan in northern Namibia on a bright, sunny day with nothing but blue sky and clouds above and kilometre after kilometre of parched earth below. Located within Etosha National Park, the salt pan is nearly 5,000 square kilometres and stretches 130 km from east to west. Nothing lives out in the hypersaline environment except some rare micro-organisms. It is just a huge swathe of earth that leaves one thinking of getting back in the car and drinking a lot of water. However to stand on it and feel the heat radiating up off the ground is to realise how vulnerable we humans really can be. Then to see a small group of boks out on the pan, in the middle of the noonday sun, you realise the lengths some animals go to survive. Better to be hot on the open expanse of the salt pan than to be a lion’s dinner! Etosha is one of Africa’s great wildlife parks, yet it exists in one of Africa’s most inhospitable climates. Driving from the south, there is nothing but scrubland for hundreds of kilometres, with huge farms trying to feed sheep and cattle on the short grasses and brush that grow intermittently in the rocky soil. Once inside the park the terrain seems to get even more arid and rocky, as if the salt pan is exerting its influence via osmosis or gravitational pull. The brush gets more sparse and vicious, with thorns and jagged edges sticking out in all directions. The effects of the excess salt blowing off the pan parches the land and temperatures rise without mercy. In this ridiculously harsh land life proliferates. Large herds of zebra, gemsbok and wildebeest wander the open plains and towering elephants move from water hole to water hole, knocking over the thorny trees. Prides of lions saunter around and birds flit here and there eating the insects that follow all these huge mammals. Visiting Etosha in the beginning of the summer months was both good and bad. It entailed long hot days driving over the parched roads or sitting in the stifling heat by a water hole hoping to see an animal or two, or two hundred wander past. But the benefit of all the heat was that water was at a premium, so animals tend to congregate near the water holes. That is the theory at least. In reality, there is so much land here and so many water holes that you have two options; either drive from hole to hole trying to see what you can see or just sit and wait at a water hole for hours, knowing eventually something will come by for a drink. Besides it being over 40 degrees in the sun, and not being able to get out of the car, we just don’t sit still for long periods of time well, so off across the huge of the expanse of the park we went! We have no regrets with our choice as the landscape was truly stunning – the emptiness stretching off into the far distance, with dots of wildlife here and there. We had some great animal experiences, from the two huge bull elephants walking right behind our car to the family of mongooses sprawled out in the shade by the side of the road. We watched giraffe graze from trees and zebra frolic by water holes. And then there were the predators. The first evening we came across a spotted hyena lounging on the road as we headed back to camp. With the sun setting behind him as he laid there lazily waking up, we sat and watched him, not more than five meters away. Being rather mesmerised by him, we at first failed to notice his two partners in crime, who were also getting ready for their nocturnal escapades. We would see these three hyenas the next morning, and evening, always in the same spot – a well placed culvert under the road. The hyenas were great to see, but it was two lion sightings that really were special. One morning on our way across an open plain we suddenly saw a pride of lions ambling towards the road. We stopped and waited and watched as 11 lionesses and young male lions, covered in blood from their night’s kill, casually walked in front of our car. These animals are truly majestic, even just walking their power and athleticism is clearly evident. Of course, they are also ridiculously lazy. Late in the afternoon we came across three lionesses crashed out in the shade of a small thorn tree. They couldn’t have been more than a meter or two from the road and they only occasionally moved to keep in the shade or to lethargically pick up their heads for a quick look around. They knew we were there and couldn’t have cared less. They are in charge in Etosha, and they know it! 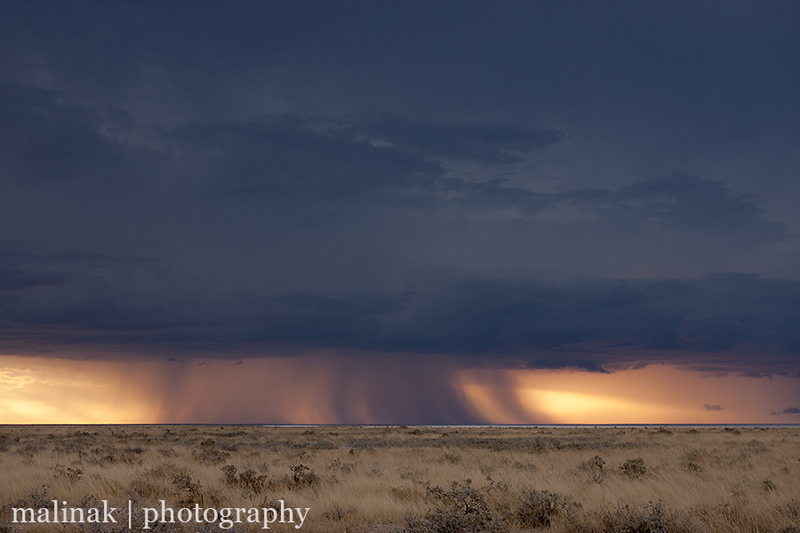 Etosha was filled with surprises, from hidden little water holes, to the behaviour of boks out on the salt pan, but the biggest surprise were the huge storms that rolled across the landscape late one afternoon. With the fading light slanting across the huge, dark clouds it was very easy to see the rainfalls in the distance. Dozens of kilometres away, these storms were clearly visible across the barren emptiness of the great pan, bringing life saving water to the mass of animals that call this ancient corner of Africa home.